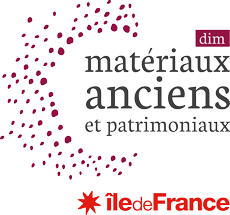 The Domaine d’intérêt majeur (DIM) Heritage and ancient materials is the Île-de-France research network dedicated to the study of ancient and patrimonial materials. Its singularity relies upon a strong interdisciplinary paradigm, which expresses through 8 transversal research thematics. It cares about improving the scientific and public knowledge about ancients materials, based on a dialog between research in physics, chemistry, computer science, environment sciences, biology and art history, archeology, paleontology and text studies. Socio-economical partners, involved in scientific research and its valorization, are members of the DIM. The DIM « Matériaux anciens et patrimoniaux » (MAP) is a region-wide research network. Its singularity relies on a close collaboration between human sciences, experimental sciences such as physics and chemistry, scientific ecology and information sciences, while integrating socio-economical partners from the cultural heritage environment. Based on its research, development and valorization potential, we expect such an interdisciplinary network to raise the Ile-de-France region up to a world-top position as far as heritage sciences and research on ancient materials are concerned. A Domaine d’intérêt majeur (DIM) is a research network, financed by the Île-de-France region for 4 years. The allocated fund is redistributed to the members of the network, based on calls for proposals. It finances PhD grants, post-doctorate researches, workshops, equipments, etc. 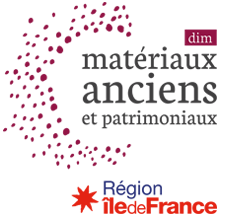 The DIM label is meant to increase the scientific standing of the research institutions from Île-de-France, by supporting structuring projects and disruptive innovations in very specific fields. In the 2017-2020 period, following a scientific expertise process, the regional scientific board decided to select 9 DIM projects. The selected projects were attributed a DIM label by the Region Council of île-de-France on 15 December 2016.